Artist’s impression of MASCOT descending towards the surface of Ryugu. A German-French probe called MASCOT is now collecting valuable data from the surface of Ryugu, an asteroid located 190 million miles from Earth. But it better get cracking—the shoebox-sized probe has only 16 hours to live. The 22-pound (10 kg) probe was designed and built by the German Aerospace Center, or Deutsches Zentrum für Luft-und Raumfahrt (DLR), in close cooperation with the French space agency CNES (Centre National d’Etudes Spatiales) and several other institutions. Measuring 11.6 inches (29.5 centimeters) at its widest, the box-shaped probe is powered by a non-rechargeable battery that’s not expected to last for more than 960 minutes. And this clock is now ticking. At 9:58 p.m. ET on Tuesday, Japan’s Hayabusa2 probe released the Mobile Asteroid Surface Scout, or MASCOT, which gently landed on the asteroid’s surface a few minutes later, according to DLR. During its 167-foot (51 meters) free fall, MASCOT descended no quicker than a walking pace. MASCOT now joins Japan’s two MINERVA-II rovers, which landed on Ryugu 10 days ago. During its free fall, the probe managed to capture 20 photographs of Ryugu, where which subsequently uploaded to the Hayabusa2 spacecraft for safekeeping. Artist’s impression of MASCOT on Ryugu’s surface. The probe has special arms to ensure proper orientation. Given its limited battery life, MASCOT is expected to expire shortly before 2:00 p.m. ET today. Before this happens, however, the tiny probe will perform various measurements on Ryugu’s surface and transmit valuable data to Hayabusa2. To do so, MASCOT will use four instruments: a camera (MASCAM), a radiometer to measure electromagnetic radiation (MARA), an infrared microscope (MicrOmega), and a magnetometer to measure magnetic forces (MASMAG). The probe will capture images at multiple wavelengths, analyze surface material, record surface temperature, among other tasks. After it performs its first set of planned measurements, the probe will hop to a second location and, fingers crossed, do it all over again before expiring; there’s only enough time for one hop. JAXA’s MINERVA-II1 and MINERVA-II2 probes will be able to make multiple leaps, hopping from location to location. Data collected by MASCOT will help scientists study the Solar System’s “most primordial material directly on an asteroid,” as DLR planetary researcher Ralf Jaumann put it. The next big milestone for the Hayabusa2 mission should come later this month. 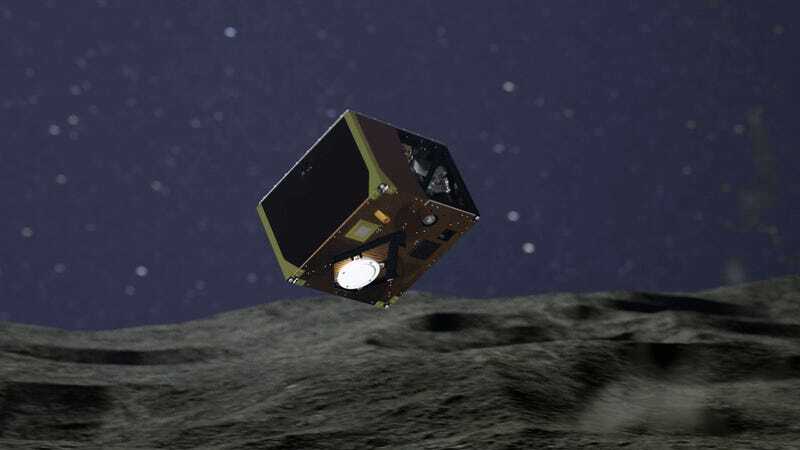 The spacecraft, after forming a crater on the asteroid’s surface with an explosive “impactor,” will descend to the crater and collect samples. Hayabusa2 and its precious cargo will then head back to Earth to complete this historic mission. Update: October 4, 2018, 3:41 p.m. ET: As Space reports, MASCOT managed to live an extra hour, expiring after 17 hours of valiant work. It even managed to make an unscheduled third hop. Congrats to the DLR team and its partners. MASCOT’s time on Ryugu may have been brief, but it took a lot of work and time to make it happen.